Ancestors Blood - Gold logo tshirt €14 Gildan shirts, gold-colour (not metallic, just Pantone colour!) print on black shirt. Sizes S-M-XL available. Click here for a photo. Angelcorpse - Of Lucifer and lightning longsleeve €20 Only XL. Barathrum - Deep from the depths tshirt €15 Heidens Hart and Barathrum proudly present official tshirt. Gildan textile, available in sizes XL and XXL. Photo / closeup. 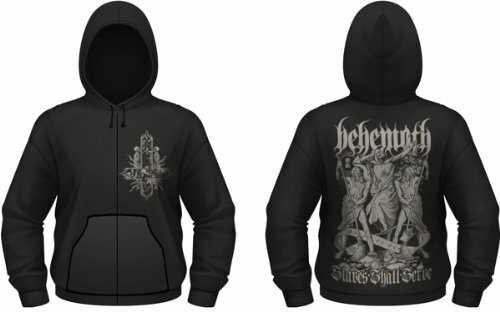 Behemoth - Slaves shall serve hooded zipper €40 Official merchandise. Size XL only. Brand: Justhoods. Click here for a photo. 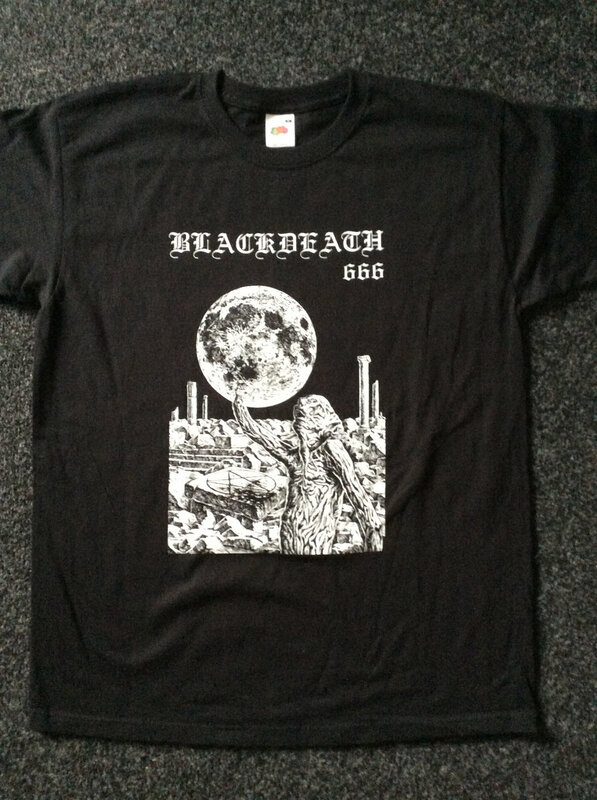 Blackdeath FFF tshirt €15 Front only, killer morbid drawing plus band name + 666. Only left in sizes L and XL. Click here for photo. Celestia - Logo longsleeve €15 Black logo on black longsleeve, looks killer. Official merchandise. Size M only. Brand: B&C. Celestia - Logo t-shirt €10 White logo on black shirt. Official merchandise. Size M only. Brand: Fruit Of The Loom. Countess - Countess tshirt €10 The wellknown and legendary design, front only. White on black shirt, only left in size L. Photo front. 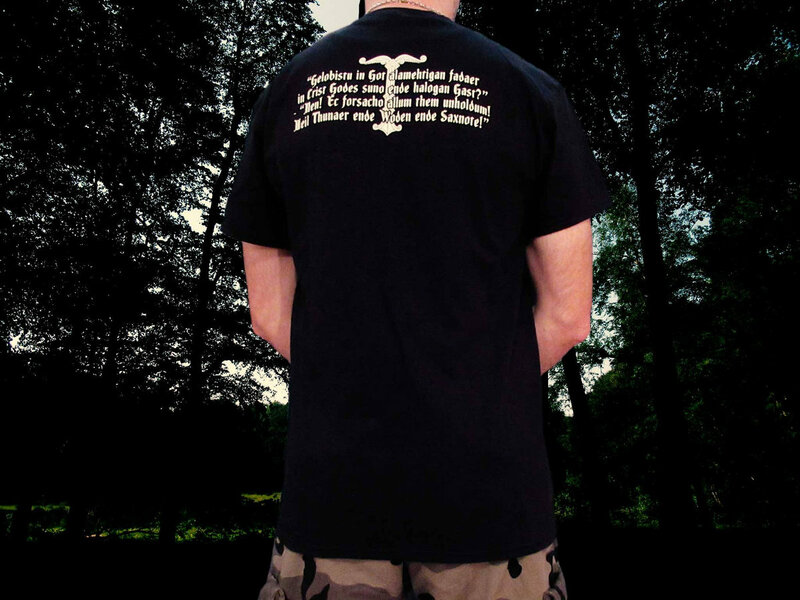 Heimdalls Wacht - Logo grau tshirt €15 Front: logo; back: SMKW symbol; right sleeve: inverted Algiz rune. All prints dark gray on black shirt, brand Gildan. Sizes M, L, XL and 3XL. Click for a photo. Ildra - Eðelland hooded zipper €30 Only sizes S and M left. High quality Gildan textile. Click for a preview picture. Immortal - Nebular ravens winter longsleeve €19 Only XL. Inferno - tshirt 2016 tshirt €13 Official tshirt with logo and drawing in grey on front; printed on high quality Gildan heavy cotton textile. Available in the sizes S-M-L. Limited edition. Click here for photos. Lugubre - Logo tshirt €10 Only front, with logo + eagle + skull + text. White on black heavy FOTL shirt. Available in all sizes S - M - L - XL - XXL. Front. Detailed scan of the print. Mortiis - Ånden som gjorde opprør tshirt €15 Three new designs with the brand new drawings for the re-releases of the Era 1 albums. As always, designed and produced by Heidens Hart in close cooperation with Mortiis. This is "Ånden som gjorde opprør" as t-shirt with the iconic new cover art in full colour on the front and re-drawn artwork from the album in light silver tone on the front and back side. Comes once again on high quality Gildan textile. Click here for photos. Mortiis - Født til å herske longsleeve €25 This is "Født til å herske" as longsleeve with the iconic new cover art in full colour on the front. Re-drawn artwork plus photo from the album-era on the back side. Title on the sleeves. Comes once again on high quality B&C textile. Click here for photos. Mortiis - Keiser av en dimension ukjent longsleeve €25 This is "Keiser av en dimension ukjent" as longsleeve with the iconic new cover art in full colour on the front. Re-drawn title artwork on back side. Title on the sleeves. Comes once again on high quality B&C textile. Click here for photos. Murw - Murw tshirt €12 One sided, full colour drawing + logo on front. Only in L and XL. Nokturnal Mortum - Weltanschauung tshirt €15 Only available in size L.
Nokturnal Mortum - Ravens tshirt €15 Click for picture, size M only, Fruit Of The Loom. Nokturnal Mortum - Lunar poetry tshirt €15 Click for picture, size M only, Fruit Of The Loom. Nokturnal Mortum - The taste of victory tshirt €15 Click for picture front / picture back, size L only, Fruit Of The Loom. Rotting Christ - In nomine... tshirt €15 High quality Gildan heavy cotton shirt with the famous sabbath drawing + logo and title on front. Back: symbol + "Since 1988" text. One of Rotting Christ's favourite shirts! Click here for photos. Available in sizes M-L-XL. European sizes but slightly bigger than usual. Very limited number of shirts available! Stargazer - The scream that tore the sky tshirt €10 Four colour front with albumcover and logo; backprint with symbol. High quality Gildan heavy cotton shirts. Available in sizes S, M, L and XL. Photo front side / photo back side. 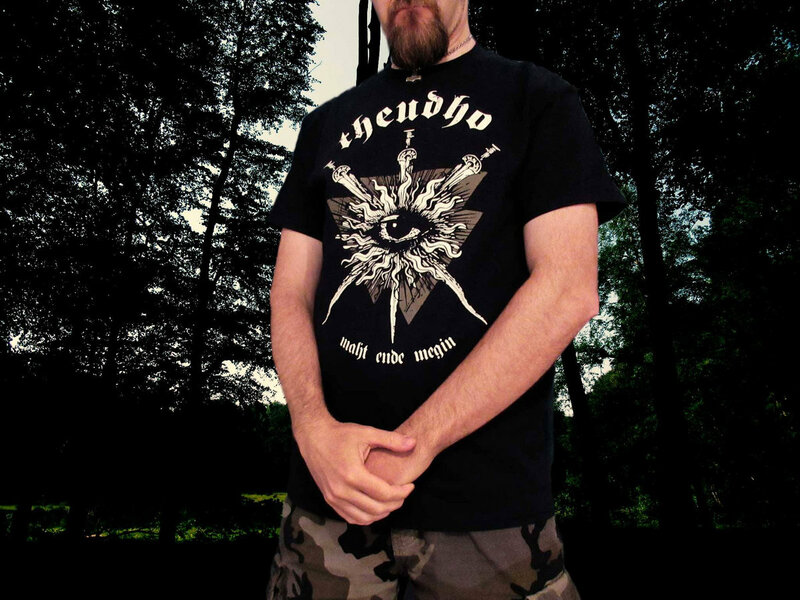 Theudho Maht ende megin tshirt €15 Official shirt for the new album, available in sizes S through XL. Photo front, photo back. Zwartplaag - Haatstorm tshirt €5 Official album tshirt, sizes S to XXL. Front: albumcover, logo, title; back: three photos + text. Front / Back. Special offer: t-shirt plus CD or tape (as you wish) for €15. Asphyx Incoming death tshirt €18 Click for photo. 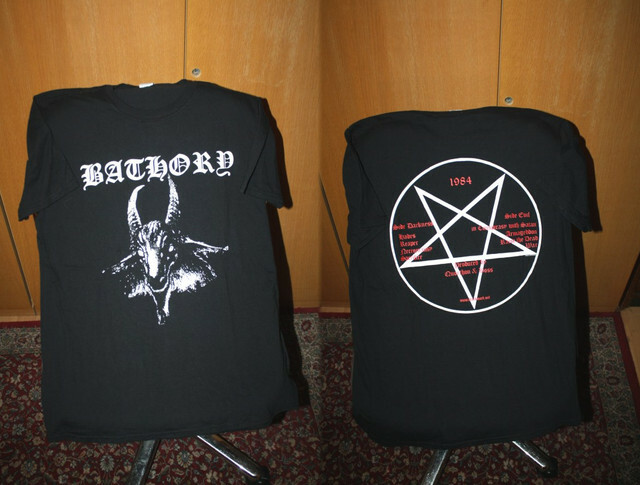 New and unworn, sizes S, M, L.
Bathory Bathory tshirt €20 Click for photo. New and unworn, size L.
Behemoth The Satanist hooded zipper €40 Click for photo. New and unworn, sizes M and L.
Behemoth Realm of the dead tshirt €35 Click for photo. New and unworn, size S.
Behemoth Slaves shall serve hooded zipper €45 Click for photo. New and unworn official zipper, size XL. Black Sabbath Skull hooded zipper €40 Click for photo. 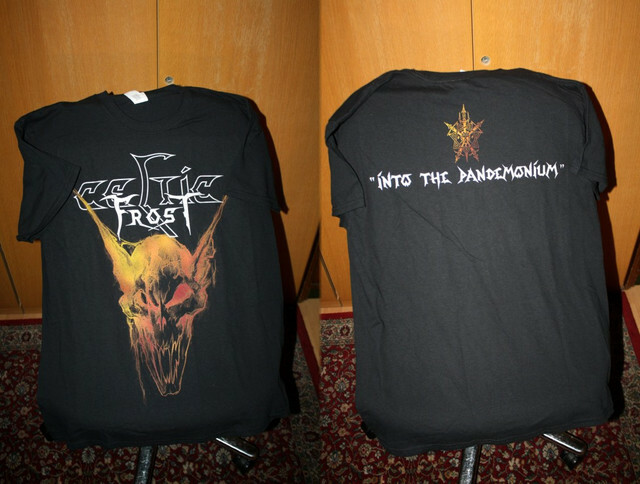 New and unworn, size S.
Celtic Frost Into the pandemonium tshirt €20 Click for photo. New and unworn, sizes L and XXL. 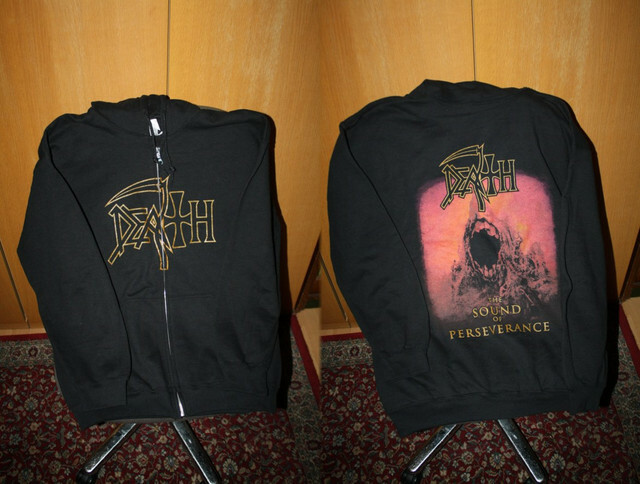 Death The sound of perseverance zipper €40 Click for photo. New and unworn, size L.
Darkthrone Black Death and beyond tshirt €20 Click for photo. 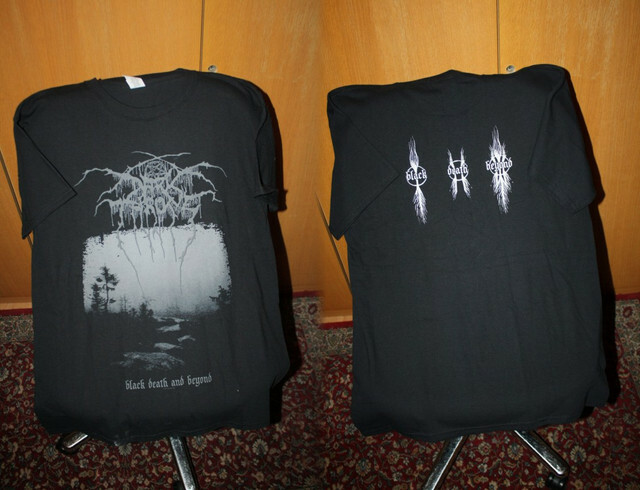 New and unworn, sizes S, M.
Darkthrone Underground tshirt €15 Click for photo. New and unworn, size L.
Darkthrone A blaze in the northern sky tshirt €20 Click for photo. New and unworn, size XL. 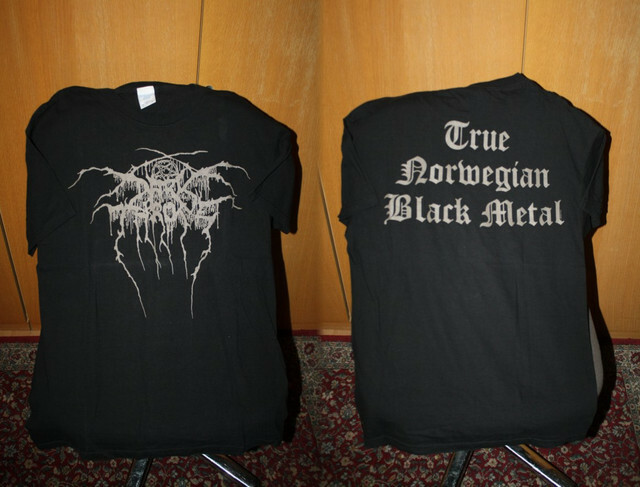 Darkthrone True Norwegian black metal tshirt €20 Click for photo. 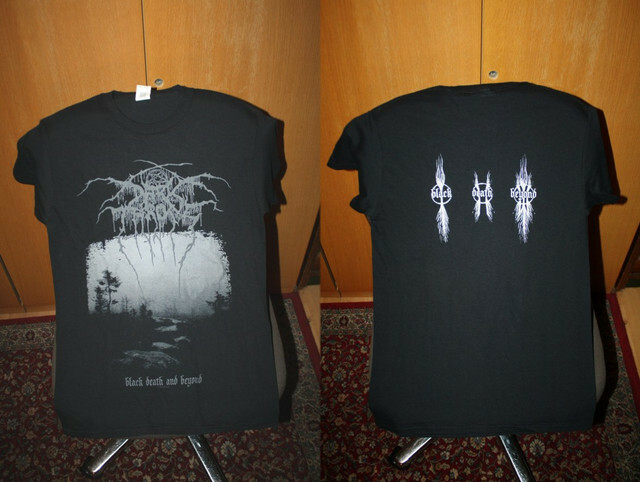 New and unworn, sizes L.
Darkthrone Black death and beyond tshirt €20 Click for photo. 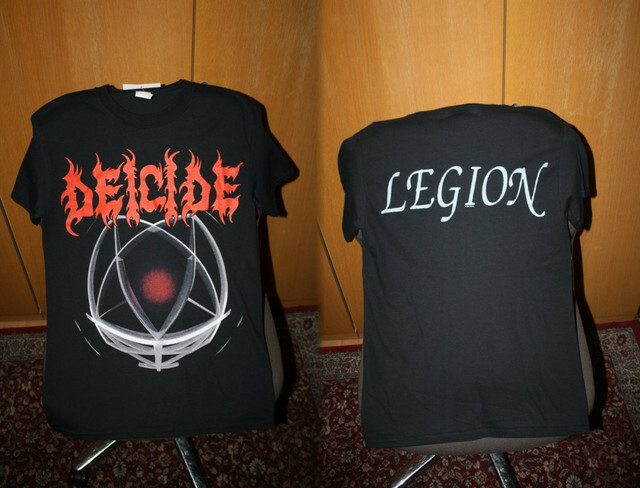 New and unworn, size S and L.
Deicide Legion tshirt €18 Click for photo. New and unworn, size S.
Emperor Equilibrium IX tshirt €20 Click for photo. 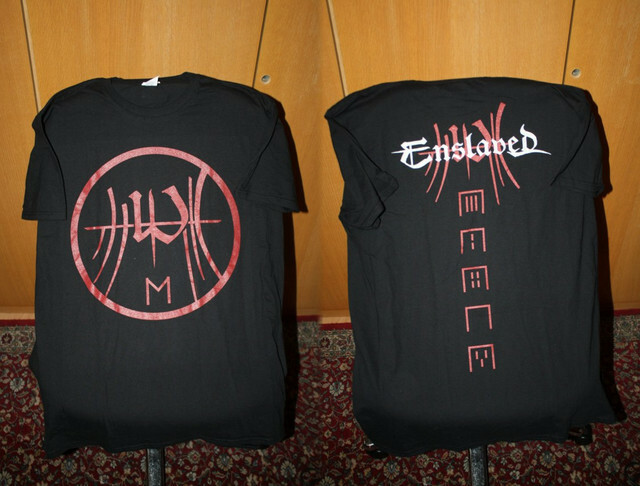 New and unworn, size M.
Enslaved E tshirt €20 Click for photo. New and unworn, size XL. 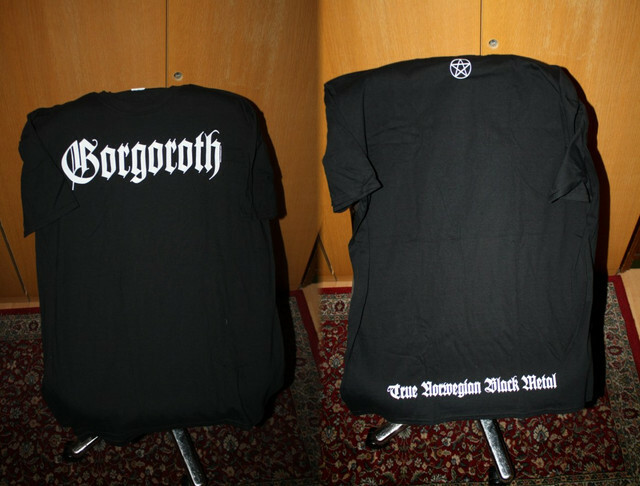 Gorgoroth Logo / True Norwegian black metal tshirt €20 Click for photo. New and unworn, size XL only. 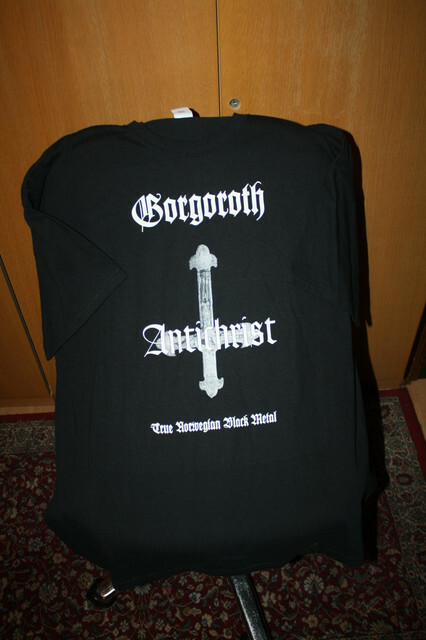 Gorgoroth Antichrist tshirt €20 Click for photo. New and unworn, size XXL. Heidevolk Velua tshirt €15 Click for photo. New and unworn, size XL. Helrunar Niederkunft tshirt €16 Click for photo. New and unworn, size XL. 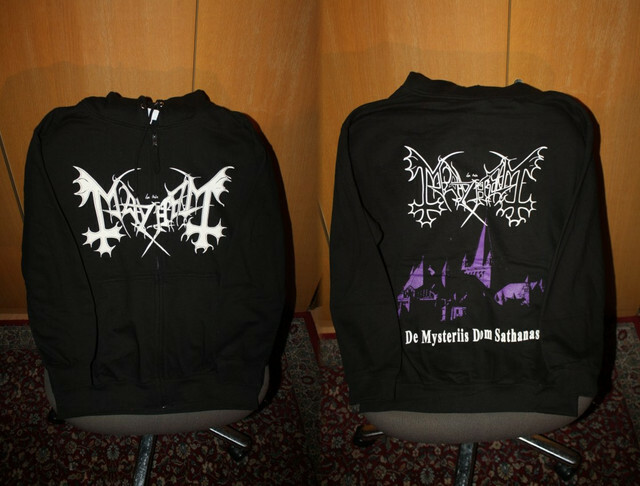 Mayhem De mysteriis dom Sathanas zipper €40 Click for photo. New and unworn, size M only. 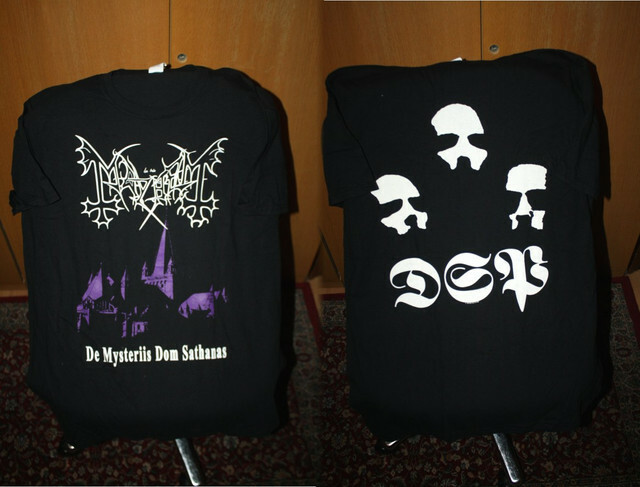 Mayhem De mysteriis dom Sathanas tshirt €20 Click for photo. New and unworn, size XL only. 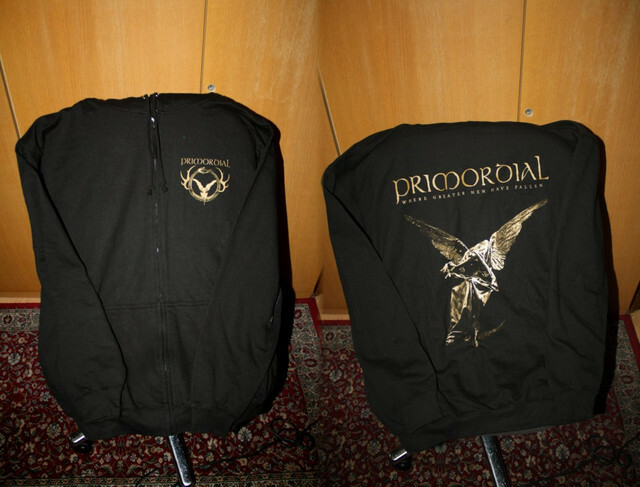 Primordial Where greater men have fallen zipper €40 Click for photo. New and unworn, size XXL. 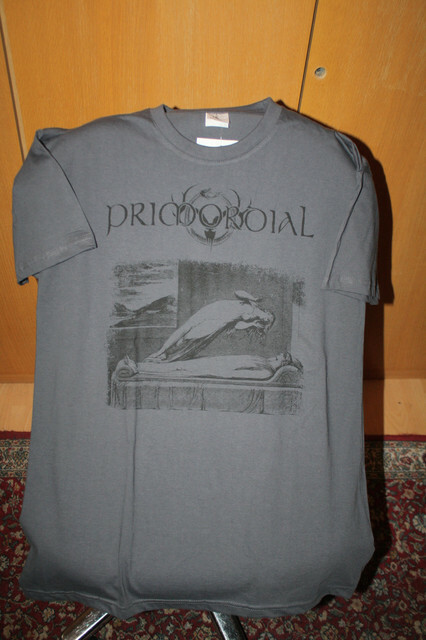 Primordial Fallen tshirt €20 Click for photo. New and unworn, size L.
Rotting Christ Horns rising tshirt €18 Click for photo. New and unworn, size XL. Satyricon Wolves zipper €40 Click for photo. New and unworn, sizes L and XL. 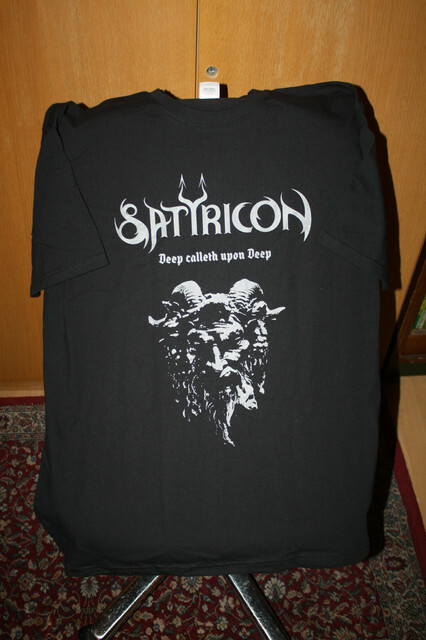 Satyricon Deep calleth upon deep tshirt €20 Click for photo. New and unworn, size XXL. 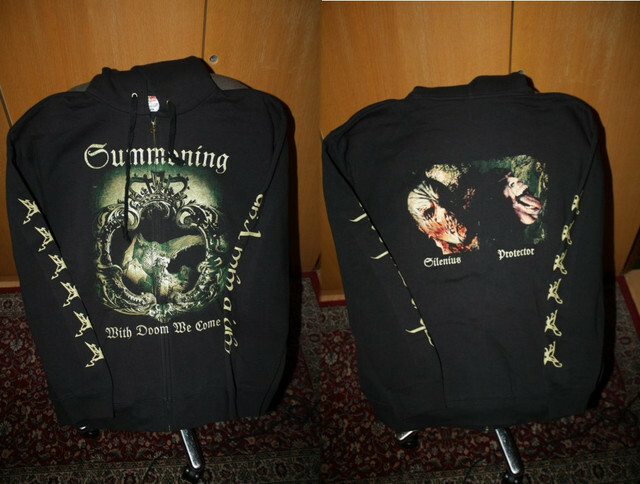 Summoning With doom we come zipper €40 Click for photo. New and unworn, size XL. Unleashed History to come tshirt €20 Click for photo. New and unworn, size XL. Abigail - Logo embroided patch €4 9x7 centimeter, last copy! Abruptum Logo embroided patch €4 White on black. These are not so good. Absu - logo backpatch €15 AMAZING big embroided patch. 26 x 25 centimeter with silver and grey logo. Arghoslent - Logo embroided patch €4 Silver on black, big size. Azaghal - Logo patch €4 White on black, 10x5 cm. Bethlehem - S.U.i.Z.i.D. patch €5 Album cover. Blackdeath - New logo embroided patch €6 New patch, big size (9,5x13 cm) white on square black patch with new logo. High quality, worth the price! Blackdeath - A.M.S.G. embroided patch €6 New patch, big size (8x12 cm) grey on shield-shape black patch with 666 logo and text. High quality, worth the price! Celestia - Logo embroided patch €3 Silver or white on black. Darkspace - Logo woven patch €5 Blue on black, 12 x 5 cm. Funeral - Logo woven patch €4 White logo. Gehenna Logo embroided patch €4 Red on black. Grand Belial's Key - Logo embroided patch €4 Silver on black, big size. Heimdalls Wacht - Shield logo patch €4 Available again! Embroided patch with the shield logo. Size: 7,5 x 11,5 cm..
Ildjarn - Logo embroided patch €4 White on black text logo, 13 x 4 cm, killer! In The Woods - Logo + atom patch €4 10x10 cm. Lugubre - Black on red logo patch €3 Embroided patch with the logo, 8 x 5 cm. Lugubre - White on black logo patch €3 Embroided patch with the logo, 8 x 5 cm. Lunar Aurora - woven patch €4 Grey logo, as always, official merchandise! 11x8 cm. Mefitic - Logo embroided patch €3 Silver on black. Mortifera - Logo embroided patch €4 Silver or white on black, big size. 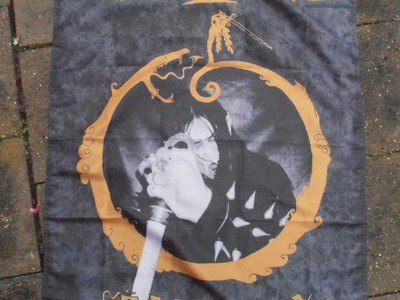 Mortiis - Ånden som gjorde opprør posterflag €15 Old school style posterflag with the original "Ånden som gjorde opprør" design. Only 50 available here! Click here for photos. Necromantia - Logo embroided patch €4 Red on black, official merch as always. Nyktalgia - logo patch €4 White on black patch, woven, official high quality patch! 12x6 cm. Regnum - 'Ich bin meine Krankheit' patch €3 10 x 5 cm. Sacrificia Mortuorum - Logo embroided patch €3 Silver on black. Sterbend - logo patch €4 White on black patch, woven, official high quality patch! 12x9 cm. Varathron Logo embroided patch €4 Bronze on black. Chtonic Nexus zine €4 Black metal/RAC/power electronics zine with Vapaudenristi, Aedh, Vaal, Ravenzang, Contortus, Reptile Womb, Pox, Charity Saints. Feohtan issue #1 zine €5 Black metal zine with Malsaint, Ravenbanner, Sanctuaire, Wodulf, Akitsa, Blood Ritual and more. Old school cut & paste layout, great! Hammer of black illumination #4 zine €6 Black/death metal zine from Finland with Vassafor, Sol Evil, Lamia Vox, Hammemit, lots of articles and more. 56 pro printed pages, in English. Kaleidoscope #17 zine €3 Black/death metal zine from Finland with Bölzer, Gehenna and two more. English. Höllentanz winter 2013/2014 zine €3 Blutaar, Wacht and more. 40 xeroxed pages, in German. Höllentanz sommer 2014 zine €3 Interviews with Azazel, Albez Duz, and other. Reviews, Mordaehoth biography and more. 40 xeroxed pages, in German. Perverse Gospel #6 zine €6 Mitochondrion, Profetus, Mournful Congregation, Cultes Des Ghoules, Ataraxie, and more. Also reviews and articles. Revelation of doom #3 zine €3 Black/death metal zine from Chile with Vomitor, Witching Hour, Black Feast, Swallowed and many more. xeroxed pages, in English. The Past Is Alive vol. I fanzine €8 English archive with Pagan Hellfire, Clandestine Blaze, Panphage, Diaboli, Inquisition, Blood Red Fog and many more. Almost 60 pages, pro-printed. Voices of the darkside book €40 Collection of issues 1-10 from this death metal fanzine from the 90s. Hardcover book with 872 pages, weighing 3,5 kilo! Limited to 1000 sealed copies. Throne Of Katarsis - Dead at Baroeg DVD €12 Official live DVD, good sound and image. V/A - Hells Headbash 2xDVD €15 Profanatica, Archgoat, Inquisition, Black Witchery, Deiphago, Midnight, Perdition Temple, Satanic Warmaster and many many more.